The IAAA Auto Insurance Claims Mediator designation signifies that an IAAA/AMA Member is a “Qualified” Certified Automotive Appraiser that has participated in training, testing and has been certified as an appraisal clause UMPIRE. The IAAA/AMA member vows to act as an unbiased Umpire who can reside over an Appraisal Clause (or Arbitration) Hearing under the rules and regulations set forth by the Federal Arbitration Act and additional arbitration regulations. 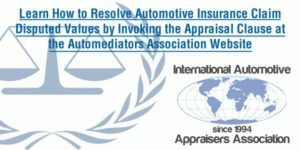 The International Automotive Appraisers Association (IAAA) has trained and certified Automediator Association Members as Appraisal Clause Umpires to fulfill the mandates that are described in most automotive insurance policies referred to as the “Appraisal Clause”. This is an option put in place by State and Federal Guidelines to help resolve first party automotive claim disagreements arising out of the value of automobiles when they are considered a total loss or if the cost to repair them is in dispute. Both insured and insurers alike should insist on using the common sense IAAA/AMA Terms and Conditions that the Auto Insurance Claims Mediators follow to get a speedy, fair and final settlement when using a certified IAAA/AMA Umpire to reside over their Appraisal Clause Hearing. The AMA can supply the names of qualified/certified automotive appraisers who are trained, tested and certified as IAAA Automediator Association Umpires to choose from. The process is an alternative that is less costly and more-timely than conventional litigation or other applicable processes that can be relied upon individuals, auto repair facilities or insurance companies.